Seamless and Grubhub should be very afraid: Amazon is testing a restaurant takeout and delivery service called Amazon Local in Seattle. 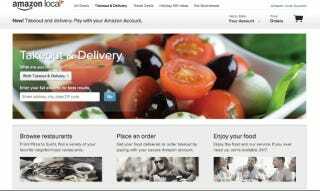 If you live in the Seattle area, you can browse for where you want to get your food and order online, then Amazon arranges how you get it. Right now, 141 restaurants have signed up for the experimental service, with 22 available for delivery. Unlike Amazon's grocery delivery service Amazon Fresh, this takeout/delivery service doesn't involve Amazon physically driving the food to your doorstep. Instead, it's just like any other online restaurant ordering system, a third-party service that rounds up local options. Since the restaurants do the actual delivering, they decide on the delivery fee and the minimum order amount.